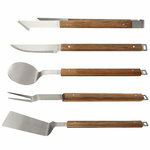 Designed by Amsell Berlin, Röshults' BBQ Tools collection features top-quality utensils for outdoor kitchen in luxurious Röshults style. 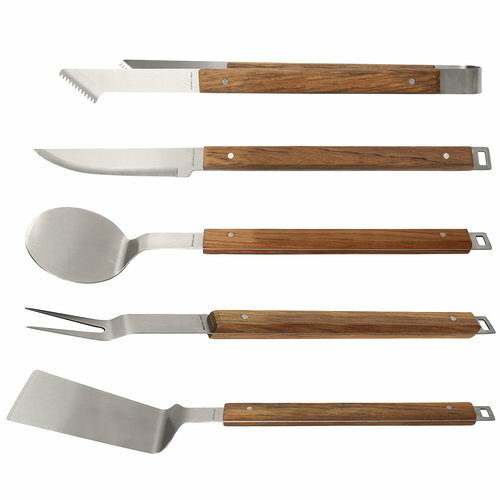 Made of strong stainless steel with beautiful teak handles, the generously sized BBQ Tools are a must for grill masters with a passion for extraordinary quality and design. The bold members of the 5-piece set are Tong, Flipping Burger, Fork, Shovel and Knife. Amsell Berlin is a Stockholm-based design studio established in 2004 by Pia Amsell and Barbro Berlin. Amsell and Berlin met each other in the 1990s while at studying at Beckmans School of Design, Stockholm. Since then, they have worked - together and individually - in various fields of design from massproduction to handcrafted objects. Amsell and Berlin share a curious and experimental approach towards design, and often find their inspiration from the beauty and intelligence of nature. Amsell Berlin’s work covers design of products, furniture, lighting, interiors and graphic design.